Lately, dinnertime has been a little, well I don’t know- let’s see how I could frame it. It’s all in the way you look at at, right? Lately, dinner time has been a little…loud…..tear-filled……almost humorous (and I say almost!) in the regularity of the crying……challenging……..did I say loud? I haven’t quite figured it out, except to remind myself that these things come in waves. Yes, life’s been a little busy, and the girls respond to that of course, and maybe dinner’s been coming out a bit later. Maybe they’re tired, and they’re definitely hungry. But it never fails to surprise me. They come home in good cheer, and I gloat to myself, “aren’t these girls just so happy!” They put on their adventure backpacks and go draw some flowers in the yard, or Sadie reads to Rosie on the couch, or on maybe there’s some time on PBS kids. We pat ourselves on the backs and feel like such good parents! But whether it’s five minutes before dinner or when we sit down or when I bring the food out, I end up holding my hands over my ears. Usually it’s complaints about the food or who had to set the table or some random thing. But I don’t think we’ve had a dinner without at least a teeny weeny bit of screaming in weeks. It doesn’t dominate- it passes and the night goes on. Girls are tucked into beds and kissed and sang to. The ringing in our ears fades. We try to figure out what we’re doing and what we should do tomorrow. This will pass, I know. But I’ve got to tell you… I’m not tasting my food. I am a dinner table advocate. I love family dinner- it is what we do! But these last few weeks, I’m really enjoying eating the food the next day, alone. 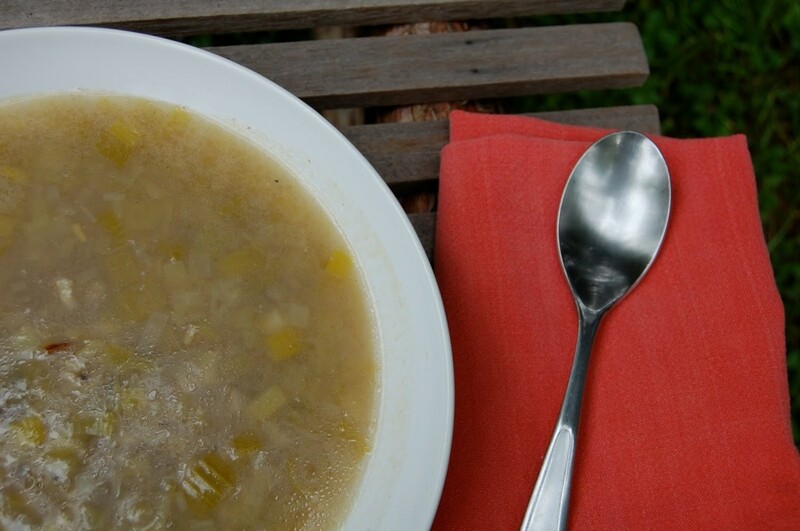 I made this soup the other night, and it went down like a quick shot of energy and warmth. In the midst of the noise, I thought, hmm, decent soup. But the next day, alone on my bench in the back yard with nothing but the birds and someone else’s hollering kid down the street, the soup was divine. Simple, with a whole lot of soul and even more nurture. It’s so easy that you could put it together with a screaming kid on your leg in the kitchen- but I’d suggest you take a bowl outside and eat it in silence. In a large saucepan, melt the butter. Add the leeks and cook, stirring often, until the leeks soften and shine, about 5 minutes. Add the garlic and celery and cook for 3 minutes. Add the stock, rice, bay leaves and chiles. Cover and bring to a boil. Reduce heat and simmer for about 1 hour. Add salt and pepper to your taste.